Edinburgh, Scotland: Heavy: Sam Sexton (24-3) W PTS 12 Gary Cornish (24-2). Cruiser: Stephen Simmons (18-2) W PTS 12 Simon Barclay (9-2). Super Middle: Tommy Philbin (10-0) W PTS 10 Rhys Pagan (14-4). Feather: Stephen Tiffney (8-0) W PTS 10 Troy James (20-4-1). Welter: Paddy Gallagher (12-3) W TKO 10 Gary Murray (12-1). Fly: Paddy Barnes (4-0) W PTS 6 Juan Hinostroza (5-8-1).Cornish vs. SextonSexton wins the vacant British title to foil the attempt by Cornish to become the first Scot to hold the British crown. Cornish made a confident start. He had huge physical advantages (6’7” 201cm vs. 6’2” 188cm) and he made good use of his jab and scored with a long right but a clash of heads opened a cut outside the Scots left eye. Sexton levelled things up in the second and then edged in front by taking the third just being quicker with his jab. Cornish was tying Sexton up whenever the Englishman got inside so the referee was having to work hard to break up clinches. Sexton also took the fourth scoring well with his jab. Cornish was on the front foot more in the fifth and wobbled Sexton badly with a right to take the round but he was also now injured under the left eye. The middle rounds were close but it was Sexton getting his punches off first and scoring with the cleaner punches as he built a lead and Cornish was bleeding from the nose and showing other signs of wear and tear. Both fighters tired and Sexton had a good ninth although he had abandoned the jab and was just swinging clubbing shots. With both fighters tired the tenth and eleventh feature more wrestling and clinching from both boxers and the referee stopped the action in the tenth to tell them to cut out the holding. Cornish tried hard over the last two rounds to turn the fight his way. He was fresher than the exhausted Sexton and made it close but just did not do enough to nick the verdict. Scores 116-113, 116-114 and 115-113 all for Sexton. The 33-year-old Sexton a former Commonwealth Champion and Prizefighter winner was having his third shot at the British title. The fight was to have been held five months ago but Sexton suffered a back injury which caused a postponement. As a result this was Sexton’s first fight for 15 months. The 30-year-old “Highlander “ Cornish, a former highland league footballer who had only nine amateur fights, suffers his second loss having been stopped inside a round by Anthony Joshua for the Commonwealth and WBC International titles in 2015. He had scored three low level wins since then.Simmons vs. BarclaySimmons gets well earned victory over a disappointing Barclay. Simmons bossed the action from the start. He kept Barclay on the back foot with a stiff jab and scored well with straight rights. Barclay showed some nice moves and landed some good counters but was being outworked. Despite Barclay having slight edges in height and reach Simmons was easily winning the battle of the jabs. It was mainly a tactical battle with very little inside work and not much body punching. Although Barclay had his moments he just never really worked hard enough and Simmons pressed the fight in every round behind that strong jab. Barclay stole a round here and there when he brought his own jab to the fore but Simmons was the one throwing more and landing more and was a clear winner. Scores 119-109, 118-111 and 116-112 all for Simmons. The 33-year-old local fighter, a former Commonwealth bronze medallist, wins the vacant IBF East/West Europe title. In October he took world rated Noel Gevor to a split decision in Germany at a time when the then unbeaten Gevor was rated No 1 by the WBO. Steelworker Barclay, 27, is a former double ABA champion. He was halted in two rounds by Matty Askin for the English title in March last year and does not seem be fulfilling the promise he showed as an amateur.Philbin vs. PaganPhilbin wins close quality fight against Pagan. Both fighters were quick and accurate with their work. Philbin scored with some stiff jabs staggering Pagan with one in the second and getting through with hard body punches. Pagan banged back with some quality work of his own but Philbin’s was forcing the fight and had a higher work rate. Pagan upped his pace from the fifth as they continued to trade punches in round after round setting a fast pace and providing plenty of entertainment. Philbin worked well with his jab in the sixth and ended the round with a furious attack. Pagan had a big seventh. He was landing heavy punches on a tiring Philbin and late in the round drove Philbin into the ropes with a cracking right and then unloaded on Philbin until the bell . Philbin recovered well in the eighth taking the old favourite left jab straight right approach but again had an uncomfortable spell as Pagan had him trapped on the ropes. Philbin had the better of a furious ninth but Pagan was stronger in the tenth rocking Philbin and the result was very much in the balance. Scores 96-95 twice and 98-93 all for Philbin who wins the vacant BBB of C Celtic title and remains unbeaten. The 27-year-old local fishmonger was a high level amateur and is now looking to move up to British title level after a few more fights. Fellow Scot Pagan had won 6 of his last 7 fights and came so close to a win here. His three losses have all been to unbeaten fighters. Tiffney vs. JamesTiffney gets the win in another excellent contest. Tiffney forced this one from the start. The quick, slick and unorthodox James was comfortable on the back foot ducking, rocking and rolling out of the way of the Scots punches. Tiffney kept switching guards but also kept working hard for three minutes in every round and it was that tireless work rate that made the difference. He was able to trap Jones on the ropes cutting down the space for the slippery James but still found the Coventry fighter a difficult target. The Scot stepped up the pace over the second half of the fight and James also stood and traded more making it a good action fight but inevitably it was James who broke off the exchanges. Tiffney had James briefly in trouble in the seventh but it was strength, stamina and work rate rather than power that was Tiffney’s stock in trade in this one. James again looked briefly in trouble in the ninth but he boxed with skill and speed to take the last. Referee’s score 98-92 for Tiffney. The 28-year-old Scot was moving up to ten rounds for the first time and had never been past four rounds. He tired a bit in the last but was a convincing winner. James, 34, possesses some excellent skills. He was 10-2 in his last 12 fights with the losses being to high quality opposition in Terry Flanagan and Liam Walsh but was outworked here.Gallagher vs. MurrayGallagher stops Murray in the last round to retain the BBB of C Celtic title but the fight is overshadowed by injury to Murray. The Scot was given oxygen in the ring and rushed to hospital where he reportedly underwent an operation to treat a brain bleed. As I write he was reported to be in a stable condition. As for the fight Murray took the first with some good boxing but by the third the stronger Gallagher was getting the better of the exchanges. A right momentarily rocked Gallagher in the fifth but he was back in control in the sixth. The seventh looked even but then Gallagher took the eighth and almost halted a bruised and battered Murray in the ninth. Gallagher landed heavy punches in the last with Murray battered and even turning away from the action before being put down. His head banged on the canvas and at first it looked as though the referee was ruling it a slip but then he started counting only to waive the count off. The 24-year-old Belfast fighter Gallagher , a Commonwealth Games gold medallist, was making the first defence of his Celtic title. Murray is in an even more important fight now and let’s hope it is one he wins and makes a full recovery. Barnes vs. HinostrozaBarnes gets easy win over inexperienced Spanish-based Peruvian Hinostroza. Barnes was able to slot punches through the porous guard of southpaw Hinostroza and land counters as Hinostroza lunged forward swiping wild punches. Hinostroza had only the most basic technique so it was no more than sparring and target practice for the talented Belfast “Leprechaun” He floored Hinostroza in the second and won every round but has sterner tests ahead. Referee’s score 60-53 for Barnes. The 30-year-old WBO European champion won two Olympic bronze medals, gold & silver at the European Championships, silver at EU championships and two golds at the Commonwealth. Down the line a fight with Chinese star Zou Shiming would be interesting as Zou beat Barnes in two Olympic quarter-finals and also beat him at 2007 World Championships. Hinostroza is 2-4-1 in his last 7 fights. Los Angeles, CA, USA: Light: Christian Gonzalez (18-1) W PTS 8 Gamaliel Diaz (40-17-3).Feather: Edgar Valerio (12-0) W TKO 2 Martin Cardona (22-9).Gonzalez vs. DiazGonzalez gets a big scalp as he beats fading former champion Diaz. The youth and speed of Gonzalez were the difference. Diaz introduced the youngster to some of the less honourable tricks of the trade but is just a shadow of the fighter he was. Despite that he still has some good moves and Gonzalez had to work hard for his win. A tiring Diaz lost a point in the last for holding and a clash of heads opened a cut over the right eye of Gonzalez in the same round but that was too late to affect the result. Scores 79-72 twice and a too close 76-75 all for Gonzalez. The 21-year-old Californian is the younger brother of former WBC feather champion Alejandro Gonzalez. He turned pro at 17 and had only 18 amateur fights so he is learning as he goes along and rebuilding after an upset second round loss to Filipino Romero Duno in March. Diaz, 36, was WBC champion for just under six months before losing his title to Takashi Miura in 2013 and is well on the way down the slope with seven losses in his last eight fights.Valerio vs. CardonaValerio overwhelms Cardona inside four minutes. The signs looked bad for Valerio when a jab from Valerio in the first round sent him staggering into the ropes. Things then got even worse for him as Valerio landed some scorching left hooks to the body before putting Cardona down. Cardona was up quickly complaining that the punch that put his down landed on the back of his head. Valerio was looking to finish things and just before the bell a left hook dumped Cardona on the canvas against the ropes. He just made it to his feet and the bell went as the eight was completed. It was over early in the second. Valerio cracked Cardona with a left to the head and then sent him sprawling with a right cross and the referee waived the fight over without a count. The 26-year-old “Kid Neza” moves to seven wins by KO/TKO. After only four pro fights his career ground to a halt as he was inactive for nearly 18 months before signing with Golden Boy. No big tests but he shows promise. Seven losses by KO/TKO for Cardona. He does OK until he tries to move up and then generally loses inside the distance. San Justo, Argentina: Middle: Alan Castano (13-0) W TKO 6 Gilberto Pereira dos Santos (14-7). Welter: Luis Veron W TKO 7 Martin Kuroski (7-3).Castano vs. dos SantosCastano halts dos Santos but it was not a stellar performance against the Brazilian. The flashy stylist Castano was too young and too quick for oldie dos Santos. Castano rocked dos Santos with rights in the first and as the Brazilian continued to march forward in the next few rounds he was being plastered with heavy body shots and only fighting in spurts. Despite that dos Santos just kept on coming and was dangerous with the occasional wild swing. In the fourth with dos Santos still walking through the shots from Castano it began to look as though the Argentinian was tiring. He was still banging jabs, hooks and rights through the guard of the advancing Brazilian but dos Santos was scoring with clubbing head punches in close. Castano put in a big effort at the end of the fifth with dos Santos trapped in a corner but the bell went when it looked as though the referee was ready to jump in. The fight ended in the sixth when Castano again cornered dos Santos and was unloading with both hands. It looked no more serious for dos Santos than the punishment he had walked through in earlier rounds but this time the referee came in and stopped the fight with dos Santos complaining strongly. The tall 24-year-old Castano, a former elite level amateur and the brother of WBA interim super welter champion Brian, gets his eighth win by KO/TKO. He did not impress although in fairness it was his first fight in nearly 11 months. dos Santos, 40, gets his second loss by KO/TKO. He is crude but strong but very limited.Veron vs. KuroskiVeron has too much skill and power for limited but brave Kuroski. Veron had edges in height and reach and was the stronger fighter. He kept Kuroski on the back foot and from the outset was landing hard jabs and scoring with left hooks and straight rights. Kuroski tried to fire back with overhand rights but before the end of the first round a Veron punch had knocked Kuroski’s mouthguard out. Veron continued to match forward behind the jab and land cracking rights although a right counter from Kuroski saw him wobbled before recovering to continue his attacks. A succession of punches at the start of the fourth saw the referee give Kuroski a standing count. Near the end of the round after a right uppercut snapped Kuroski’s head back the referee applied a second standing count. Veron continued to hand out punishment in the fifth and sixth and had Kuroski in deep trouble at the bell to end the sixth. There was some confusion over the result as it was given as a win by TKO in the seventh for Veron although Kuroski did not come out for the seventh round. The unbeaten 25-year-old from Jose Leon Suarez (it is a town) was another top level amateur and fought for the Argentinian Condors in the WSB. Second loss by KO/TKO for Kuroski. Melbourne, Australia: Heavy: Demsey McKean (11-0) W TKO 6 Willie Nasio (10-3). Super Light: Carlos Portillo (19-0) W TKO 3 Czar Amonsot (34-4-3,1ND).McKean vs. NasioMcKean makes good use of his physical advantages and southpaw style to outbox, break down and knockdown champion Willie Nasio and win the Australian title. The 26-year-old 6’6” (198cm) former kick boxer from Queensland was interim champion and won the “Last Man Standing” Tournament last year. This is his fifth win by KO/TKO. New Zealander Nasio put together a run of seven wins before losing to Kyotaro Fujimoto for the OPBF title in January.Portillo vs. Amonsot Huge upset here as untouted Portillo halts WBA No 3 Amonsot. After a cautious start over the first two rounds Portillo exploded in the third. He landed a thunderous right hook that put Amonsot down heavily. He struggled to make it to his feet and when he did was unsteady and the referee correctly stopped the fight. The 24-year-old Paraguayan gets a career best win. He was 18-0 going in which might have looked a risky fight for Amonsot to take but of his victims 11 had never previously had a fight, 3 had never won a fight and none of the other four had positive records. It was also his first fight in 19 months and his first fight outside of the Paraguayan capital Asuncion. This win will catapult him into the world ratings which makes up for his disappointment of failing to qualify for the Rio Olympics under the rule allowing pro boxers to participate. Filipino-born Amonsot was unbeaten in his last 19 fights and looked close to a title shot but has to start again. He is not a stranger to that as after losing in a brutal twelve round fight with Mike Katsidis for the interim WBO light title in 2007 Amonsot was taken to a local hospital in Las Vegas. An MRI examination revealed a tiny brain bleed. Amonsot was eventually cleared to box again after a series of MRI’s and CT scans showed “complete resolution” of the injury but he was inactive for 17 months as those tests and examinations were carried out. He has good backing and support so can come again. Stuttgart, Germany: Super Middle: Chris Eubank Jr (26-1) W KO 3 Avni Yildirim (16-1).Super Middle: Stefan Haertel (15-0) W PTS 10 Viktor Polyakov (13-2-1). Cruiser: Firat Arslan (41-8-2) W KO 7 Alejandro Valori (24-12). Super Middle: Denis Radovan (7-0) W PTS 8 Tiran Metz (14-3-4). Super Light: Timo Schwarzkopf (8-1) W PTS 8 Massimiliano Ballisai (20-5). Super Middle: Zach Parker (14-0) W PTS 8 Matingu Kindele (9-7). Super Middle: Leon Bauer (12-0-1) DREW 6 Atin Karabet (3-1-1).Eubank vs. YildirimRound 1As expected Yildirim marched forward behind a high guard crowding Eubank who kept moving on the back foot and jabbing. Yildirim continued to force the fight but a cornered Eubank landed a stunning right uppercut to the chin of Yildirim who dipped at the knees with one knee touching the canvas. Despite his protests it was a rightly counted as a knockdown and an ominous sign for the Turk. After the eight count Yildirim was again walking Eubank down but being caught with jabs and uppercuts as he moved forwardScore 10-8 EubankRound 2Yildirim had a bit more success in this round as he was able to get close and work with hooks and uppercuts and also managed to trap Eubank on the ropes briefly. However Eubank was slotting home jab after jab, scoring with straight rights, hooks and uppercuts on the advancing Yildirim and making the Turk miss time and time again with clever defensive work.Score 10-9 Eubank 20-17Round 3The third started explosively with both fighters just trading heavy punches over the first 30 seconds. Eubank then went onto the back foot scoring with his jab before taking on Yildirim in a trial of strength as each tried to shunt the other back. Eubank shook Yildirim with a left and then fired a volley of flashing head punches and drove Yildirim back across the ring. Yildirim tried to punch back but the incoming artillery was thick and fast and the Turk’s guard was overwhelmed by the speed and fury and a final right/ left combination put Yildirim down heavily and the referee immediately and right waived the fight over as Yildirim was finished.Eubank was making the second defence of his IBO title and progresses to the WBSS semi-final where he will meet either George Groves or Jamie Cox. 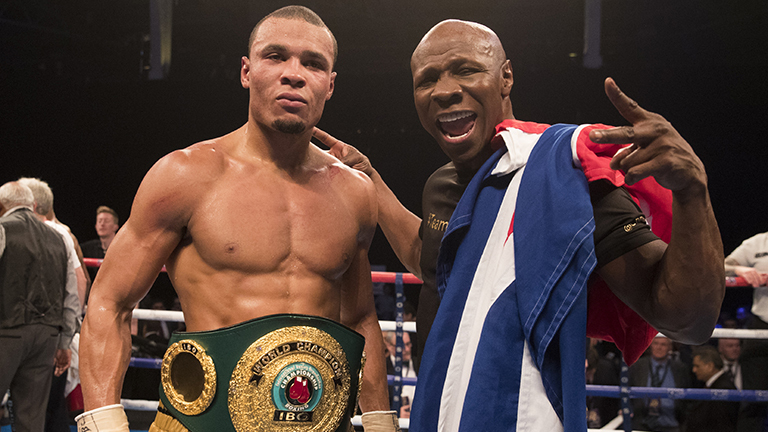 This is the most impressive win so far for Eubank as this WBSS Tournament begins to offer fights that might not otherwise have happened. Yildirim, rated No 3 by both the WBC and WBA has traded on his strength and power but Eubank cleverly nullified those attributes and Yildirim will have to rebuild but at 26 he has the time and the backing.Haertel vs. PolyakovHaertel gets controversial split verdict over Polyakov. Haertel is a quick boxer with a very useful jab but lacks power and that meant that Polyakov although shorter and with a shorter reach could bundle forward without too much danger of being caught with a powerful counter. Polyakov sent Haertel staggering back with a couple of rights just before the bell to end the first round and took the second round. Haertel did better in the third and fourth. He was able to get on the front foot, increased his work rate moved cleverly and worked the jab more. Polyakov was still storming forward throwing hooks but Haertel was blocking many of the Russian’s hooks and brining his right into play. The fight continued in the same pattern. Haertel was on the front foot making use of his longer reach and Polyakov had his best moments when he was able to take Haertel to the ropes and unleash a bunch of hooks. Polyakov was given a stern warning after butting Haertel in the body and sending him down and was a bit careless with his head. A big left hook from Polyakov shook Haertel in the ninth and he looked to have outworked the German in the last and deserved at least a draw. Scores 96-94 twice for Haertel and 95-95. The 29-year-old former Olympian-he lost to Anthony Ogogo in the quarter-finals in London-remains unbeaten but despite his excellent skills. However with his lack of power, just one win by KO/TKO, it is difficult to see him as a threat to the top fighters and his declared hope that he might get into the WBSS if either Eubank or Yildirim were forced to pull out certainly counts as a case of be careful what you wish for. Polyakov was inactive for almost five years between March 2012 and February this year. He had a loss and a draw in his first two fights back but was coming off impressive wins over Dariusz Sek and former WBA secondary title holder Giovanni De Carolis and was unlucky here.Arslan vs. ValoriTypical Arslan fight and typical Arslan win. The seasoned former holder of the WBA secondary title took centre ring and commenced to bludgeon the vastly overweight Argentinian. By the third Valori was already starting to wilt. He has very limited skill and was too slow and lacked the power to match Arslan in this close-quarters brawl. Body punches drained the resistance out of Valori but it was a left to the temple that saw the Argentinian’s legs turn to rubber and he staggered back and then pitched face down on the canvas. He made it to one knee but got no further. The 47-year-old Arslan gets his seventh win since losing a split decision to Yoan Pablo Hernandez for the IBF title in 2014. He is a ridiculous No 3 with the WBO so another title shot is a possibility. Valori came in as a very late choice. He is 0-9 in fights outside Argentina and 8 of those losses have come by KO/TKO.Radovan vs. MetzGerman hope Radovan remains unbeaten with wide unanimous decision over Armenian-born Metz. No real problem for Radovan. He was able to find plenty of gaps in the porous defence of Metz dominating the fight with his jab. Metz did enough to take one round but was never really in with a chance and Radovan was a clear winner. Scores 79-72 for Radovan from all three judges. The 24-year-old was an outstanding Junior and as a Senior won the German title in 2011 and 2012 and was runner-up in 2010,2013 and 2014. He scored wins over England’s Anthony Fowler and current unbeaten Top Rank prospect Jason Quigley. German-based Metz keeps his record of never losing by KO/TKO.Schwarzkopf vs. BallisaiSchwarzkopf only just squeezes past Italian Ballisai. Schwarzkopf made the better start but from the third Ballisai was doing some good work in spells going to the body. The rounds were close with Schwarzkopf landing some impressive body punches pressing hard and firing quick accurate shots. Schwarzkopf had the higher work rate and just deserved the close decision. Scores 77-75 twice and 78-74 all for Schwarzkopf. The 25-year-old Schwarzkopf was born in Kosovo but came to Germany as a refugee and is now a German citizen. He makes it four wins in a row since losing on points to Anthony Yigit in 2015. Former undefeated Italian champion Ballisai had a bad 2016. He lost big fights against Edis Tatli for the European title and to world rated Yvan Mendy and also failed to qualify for a place at the 2016 Olympics.Parker vs. KindeleEngland’s Parker celebrated signing a long term contract with Team Sauerland with a win. Belgian Kindele gave Parker a good test raking Parker with a left hook in the first and later in the fourth opening a bad cut over Parker’s right eye. However Parker had much the better skill set and outboxed Matingu in round after round and had a strong last round to run out the winner by wide margins on all three cards. Scores 80-72 twice and 79-73 all for Parker. The 23-year-old from Derbyshire was hugely impressive in stopping Luke Blackledge inside a round five weeks ago. He is No 13 in the EBU ratings. German-based Kindele usually goes the distance.Bauer vs. KarabetUpset here as hot prospect Bauer losses his 100% record against novice Karabet in a very unimpressive performance. Bauer was the better stylist easily switching guards but had problems with the pressure and the unorthodox style of Karabet and was caught too often by right hands for his own comfort. He was unable to find space to use his physical advantages and superior skills and a strong finish by Karabet made a draw looked a fair result. It injected a touch of realism into the expectations of the 19-year-old German “Wunderkid”. Karabet’s other loss was on points against unbeaten Sauerland fighter Denis Radovan in March. Manchester, England: Light: Anthony Crolla (32-6-3) W PTS 12 Ricky Burns (41-7-1). Welter: Mohamed Mimoune (19-2) W PTS 12 Sam Eggington (21-4). Light: Lewis Ritson (13-0) W TKO 7 Robbie Barrett (15-3-1). Light: Scott Cardle (22-1-1) W PTS 6 Lee Connelly (7-28-3). Welter: Connor Benn (9-0) W TKO 1 Nathan Clarke (5-2-1). Feather: Gavin McDonnell (18-1-2) W TKO 1 Jozsef Ajtal (19-9). Light Heavy: Hosea Burton (20-1) W TKO 1 Ratu Latianara (5-0). Light: Charlie Flynn ( 9-0-1) W PTS 6 Liam Richards (12-40). Super Bantam: Joe Ham (12-0) W PTS 6 Jose Aguilar (16-40-4).Crolla vs. BurnsThis was seen as a must win fight for both men and it was Crolla who got the victory but the closeness of the fight had Burns looking for a return. Both are class boxer and both tried to establish their jab early. Crolla seemed to do the better work over the first two rounds scoring well with hooks to the body with Burns trying to use his longer reach to score on the outside. They clashed heads in the second which saw Crolla marked under his right eye but thankfully there was no other injuries from the clash. Crolla seemed to have built a lead over those opening three rounds but Burns was rolling by the fourth. Burns was on the front foot in the finally making an impression in the fight. He was looking to land some big rights but Crolla’s good defensive work blocked many of them. The fifth and sixth were both close as each took turns to have purple patches and much of the fight was going on inside. Burns had a good seventh as he landed a big uppercut which brought blood from Crolla’s nose. The eighth swung back to Crolla as he used a stiff jab to put Burns on the back foot and was able to work Burns over on the ropes but Burns fired back in the ninth with a jab again staring blood weeping from Crolla’s nose. The Scot also had the edge in the tenth rocking Crolla with a good right to the head but that swing went back in Crolla’s way in the eleventh as he dominated the round taking Burns to the ropes and landing well to hard and body. The last was a microcosm of the fight. Two class boxers giving all they had but in controlled aggression with quality punches and no wild hitting and hoping. Again as the fight had developed so went the round. Crolla did better at the start of the round and Burns came on strong at the end but for me Crolla just did enough to take that round and the verdict. Scores 117-112, 116-113 and 116-114 all for Crolla but I felt the last reflected the fight as I saw it. Both fighters are probably nearing the end of their career so the next step is very important. The win will mean that another world title fight is possible for Crolla. Burns wants a return but before committing himself to that naturally Crolla wants to see what other offers there are out there. Former three division world champion Burns has put his terrible display against Julius Indongo behind him. If he can’t get a return with Crolla then an all-Scotland clash with Commonwealth champion Josh Taylor would be a big fight but with Terrence Crawford talking about moving up to welterweight all four versions of the super light title will be vacant and who knows what might happen then.Mimoune vbs. Eggington Mimoune lifts the European title with split decision over Eggington. Defending champion Eggington made a fast start scoring with two rights in the first 30 seconds and went on to edge the opening round but southpaw Mimoune showed he was quick and clever. In the second and third Mimoune was scoring with quick burst of punches from both hands and moving and covering to negate Eggington’s attacks. There was not much power in the Frenchman’s punches but he was scoring. Eggington pressed harder in the fourth going to the body more and took the round. After four rounds the official scores were 39-37 twice for Mimoune and 38-38, Although Eggington continued to press the fifth saw Mimoune getting his punches off first and frustrating Eggington with his speedy footwork. Eggington closed the distance better in the sixth but all of these rounds were very close. It was the same in the seventh with Eggington thumping home some good body punches and Mimoune throwing burst of light hooks. Eggington had the best of the eighth pursuing Mimoune around the ring and firing home long shots to the body as he move closer on the scoring. After eight rounds the scores were 78-74 for Eggington and 77-75 and 76-75 for Mimoune. The ninth was crucial. Eggington started well but by the end of the round Mimoune was landing with quick hooks and uppercuts and clearly took it. Mimoune also took the tenth. Eggington was waiting too long to get his punches off and not able to cut the ring off. Mimoune was moving and punching threading home light but eye-catching shots and it was his round despite a strong finish from Eggington. In the eleventh Eggington let his hands go more and closed with Mimoune quicker with the Frenchman’s work rate dropping. There was a brief break in the last as Mimoune was given time to recover from a low right from Eggington. It was Eggington’s round as he kept marching forward scoring regularly to the body and outworked Mimoune. It was a very close fight but the strong showing by Eggington over those last two rounds was not enough to help him preserve his title. Scores 116-112 and 115-113 for Mimoune and 116-112 for Eggington. The 30-year-old Mimoune had won his last seven fights but Eggington was a class above those victims. On the night the clever boxing and hand speed worked for him and he was a worthy winner. It is a big set-back for Eggington. Inside the distance wins over Frankie Gavin, Paul Malignaggi and Ceferino Rodriguez had propelled him to No 7 in the IBF ratings and No 9 with the WBC. Now he has some reconstruction work to do but is only 23 so has time and the ability to succeed. Once again it shows that the high standard set by the EBU makes it hard to win their titles and just as hard to hold on to them.Barrett vs. RitsonRitson wins the British title as he crushes game champion Barrett. A confident Ritson took the fight to southpaw Barrett from the start forcing the champion onto the back foot and scoring with some rib bending body punches. Barrett had looked good in beating Scott Cardle for the title but Ritson was just walking him down and Barrett could not keep him out. Early in the second with Barrett in a corner Ritson crashed a left and a right onto Barrett’s chin and he went down on his hands and knees. He had no trouble beating the count but it was an ominous start with less than four minutes gone in the fight. Barrett tried to get inside but hooks and uppercuts from Ritson drove him out Ritson continued to land punishing shots and after a couple of head punches Barrett tumbled forward putting his gloves on the canvas but Ritson had also given him a push so it was not counted and Barrett survived a near disaster. Ritson continued to walk Barrett down in the third but Barrett boxed well on the back foot and managed to avoid any repetition of the near disaster in the second. Barrett used good movement and some clever boxing to frustrate Ritson in the fourth and for most of the fifth and seemed to be getting a foothold in the fight but Ritson scored with some solid shots at the end of the fifth. In the sixth a left hook to the body saw Barrett drop to one knee in pain. He got up just as the count reached eight and was able to continue. Only seconds later a right to the body put him down for the second time in the round. He got up again and although Ritson landed some more hard punches Barrett was fighting back at the bell. and it looked as though Ritson might have punched himself out. Barrett was boxing well early in the seventh landing jabs and straight rights and having Ritson the back foot. However he lacked the power to keep Ritson out and after a right to the body put Barrett down again the referee started to count and then waived the fight off. Barrett started to complain but he had not seen the towel that came flying in from his corner. “Sandman” Ritson, 24, makes it seven wins by KO/TKO. He was vastly impressive here as he traded his Northern Area title for the British title. He has shown growing power and this is his sixth inside the distance wins in his last seven fights. Barrett 25 just could not find a punch to keep Ritson out and could not match the superior firepower of the challenger. At 25 he will come again and challenge for a title again.Cardle vs. ConnellyCardle gets in some useful ring time as he outpoints Connelly. Cardle clipped Connelly with a punch to the forehead in the first that seemed to shake Connelly but Connelly recovered. Cardle pressed hard for the full six rounds with Connelly showing some good movement and a useful jab to stay in the fight and make Cardle work. Cardle used his jab well and landed some good left hooks to the body but perhaps took a few punches more than he would be happy with. However he won every round and will continue his rebuilding with a view to regaining his British title that he lost on a majority decision to Robbie Barrett in April. Referee’s score 60-54. Connelly is now 1-8-1in his last ten fights but did the job he was brought in to do. Benn vs. ClarkeBenn overpowers Clarke for another first round win. Clarke showed some confidence in the early sparring until a right to the head sent him down. He was up quickly and ready to continue after the count. Benn jumped on him with triple left hooks and a couple of rights that put Clarke down for the second time. Again he was up quickly and responded convincingly when checked by the referee but after a couple of head punches sent him back into the ropes the referee stopped the fight despite vigorous complaints from Clarke. Now seven wins by KO/TKO for the 21-year-old from Essex and his fourth first round win. He is ready for stiffer opposition. Clarke had won his last five fights but was outgunned here.McDonnell vs. AjtalJust a ticking-over fight for McDonnell as he floors Ajtal twice and knocks out young Hungarian as waits to see what is next in his career. Second win for McDonnell since losing a majority decision to Rey Vargas for the vacant WBC super bantam title. Late choice Ajtal 20, has lost 5 of his last 6 fights by KO/TKO so a very predictable outcome.Burton vs. LatianaraThis one was over quickly. Scottish-based Fijian Latianara was giving away lots of height and reach and decided his best approach was to lunge inside. As he tried that a short left from Hosea put him down. He was up quickly and after the eight count launch another attack only to run into a series of head punches that put him down for the second time. He continued to take the fight to Burton but when a left hook staggered him the fight was stopped. The tall, 6’4” (193cm) Burton gets his second win since losing his British light heavy title on a twelfth round stoppage against Frank Buglioni in December. He is up at cruiser now which may suit him better. Latianara brave but out of his depth.Flynn vs. RichardsScottish prospect Flynn outboxes Richards. Flynn showed excellent skills working the jab well and mixing in the full package of hooks and uppercuts. A furious attack at the end of the first had Richards in trouble and it looked like an early night but Richards survived. Flynn dominated from there. He was hunting Richards down and scoring with some crunching body punches. Richards was constantly under fire but always fought back and despite the punishment was still there at the end. Referee’s score 60-54 for Flynn. The 23-year-old “Mailman” won a silver medal at the Commonwealth Youth Games and gold at the Commonwealth Game in 2014. He was Scottish and British amateur champion and an outstanding prospect. The draw on his record was a technical one. After a promising start to his career Richards has settled into the “opponent” role and does a good job of giving prospects such as Flynn some ring time with only one loss by KO/TKO.Ham vs. AguilarScottish Area champion Ham gets another win as he convincingly outpoints Nicaraguan Aguilar. Ham swarmed all over the import winning every round but Aguilar’s speciality is survival and Ham could not put him away. Referee’s score 60-54 for Ham. The 26-year-old Ham hails from the Gorbals area of Glasgow. It used to be known as the toughest area in European and as the only place where the milk floats were fitted with a rear gunner! It is a regenerated place now and those days are well behind it. Ham won 10 Scottish titles including five in a row at Senior lever and was British Youth and Senior champion. Aguilar has lost his last 25 fights 21 on points. London, England: Fly: Andrew Selby (10-0) W PTS 12 Maximino Flores (23-4-1). Cruiser: Luke Watkins (12-0) W TKO 6 Robin Dupre (12-1). Super Welter: Asinia Byfield (14-1) W TKO 5 Gabor Gorbics (23-9).Selby vs. FloresSelby wins wide unanimous decision over Flores in this WBC Eliminator. The skeletal Mexican was almost as much of a showman as Selby which is a stretch. Flores started the fight at a frantic pace lunging forward with wind milling arms throwing a huge volume of punches. It took Selby by surprise and he only began to settle down at the end of the opening round. The pattern of the fight varied very little Flores marching forward head down throwing bunches of punches trying to overwhelm Selby with quantity. Unfortunately for Flores with his head down he had no idea where his punches were landing and his pumping action whilst fine for quantity meant there was very little power in his punches. Selby was able to block and dodge most of those that were on target and did not have to worry about the majority which flew past or landed low. Selby made this more difficult than it should have been. He was miles ahead of Flores on skill but at times showed his arrogance by literally dropping both hands and allowing Flores to land clean shots. It worked as Flores is not a power puncher but would be a huge mistake against some other fighters. In round after round the quality work came from Selby. He showed great movement and landed counter after counter but worryingly he could not stop the Mexican’s forward march and was getting caught with punches he should not have been caught with. Despite this there was no doubt that Selby was always winning the fight but was made to work much harder than usual by the seemingly limitless stamina of Flores who was still slinging wild wide punches to the last bell. Scores 119-109, 117-111 and 117-112 all for Selby. The brilliant Welsh WBC No 3 has a good chance of a title shot but as the WBC, WBA and WBO champions are Japanese and the IBF holder is Filipino Donnie Nietes he may have to travel to get his chance. It was of concern here that he could not keep Flores out and if he is going to win a title he may have to cut out some of the flashy stuff and be prepared to fight hard and focus in every round. I would take him to beat the WBC No 1 Waseem Muhammad and No 2 Francisco Rodriguez and WBC champion Daigo Higa has had only 13 fights so who knows by 2018 Wales and the Selby family might have another world champion. Flores certainly came to win and certainly entertained but never looked like threatening Selby’s progress.Watkins vs. DupreYou don’t need two stars boxers to make a great fight as these two relative novices showed. Although the power of Watkins brought him victory and the vacant Commonwealth title Dupre came away with his reputation greatly enhanced. Dupre was an unlikely looking star of the night with his chubby/flabby appearance but he showed surprising speed. Over the first two rounds he was sliding home jabs and rocking Watkins with right uppercuts inside taking both rounds. Watkins was loading up on his punches looking to take Dupre out. His power was evident when he landed with his right but every time Dupre was hurt he just waded back into the fray. Watkins found that punch he was looking for in the third. He staggered Dupre with a right to the head and landed two more with Dupre dropping to one knee. After the eight count Dupre waded back into the fight but Watkins was always dangerous with his rights. Watkins landed more rights in the fourth and fifth. Dupre was tending to rush in head down but despite some punishment he kept taking the fight to Watkins and again finding the target with uppercuts. At the end of the fifth Watkins rocked him with a big right and drove Dupre back with more rights with Dupre badly shaken at the bell and showing a cut outside his left eye caused by a punch. Watkins went out to finish it in the sixth but initially was driven back by punches from Dupre. Watkins again nailed Dupre with a right and had Dupre staggering on unsteady legs before landing a clubbing right and a vicious uppercut inside which sent Dupre reeling and brought the referee’s intervention. The 27-year-old “Duke” Watkins gets his eighth win by KO/TKO and showed impressive power. Dupre, 30, showed good skills and loads of determination and came away with his reputation greatly enhanced.Byfield vs. GorbicsByfield easily halts a game Gorbics. To say Byfield has an unorthodox style would be a great understatement. The tall fighter from Reading has speed and skill and can switch guards in the blink of an eye and yet he made this harder than it needed to be. From the first he was hunting down the Hungarian. Gorbics spent much of the fight circling the perimeter of the ring with Byfield pacing after him and landing some hurtful shots to head and body. You had the feeling Byfield could finish this one any time he liked but his constant switching of guards was disrupting his own rhythm and he often got his legs too close together to apply any leverage and ignoring was defence. Gorbics was able to leap in and scoring with rights to the head but Byfield shook them off and kept stalking Gorbics. He was slowly breaking the Hungarian down and in the fifth he trapped Gorbics in a corner and landed two hooks to the head and then went downstairs with a crunching body punch that put Gorbics down on his hand and knees in pain. Gorbics tried to rise but was counted out just before he made it all the way up. Fifth win in a row for Byfield after losing to more experienced Arthur Hermann in April 2016. He has tremendous talent but the tactics he employed here were alright against a fighter such as Gorbics but would be dangerous against a quality fighter with a punch. Now 6 losses in his last 7 fights for Gorbics who was a late pick for this slot. Buenos Aires, Argentina: Welter: Cesar Barrionuevo (33-3-2,1ND) W KO 6 Adrian Veron (21-2). Welter: Gabriel Ledesma (11-1) W TKO 8 Carlos Aquino (17-3).Barrionuevo vs. VeronThis all-southpaw scarp was being touted as the “Fight of the Year” but it did not live up to that. A cagey first round saw lots of prodding jabs with the only punches of note being two right hooks from Barrionuevo. There was a bit more action in the second. Barrionuevo was forcing the fight and throwing more punches but was very wild. Veron was just waiting too long and not throwing much. Veron edged the third with his better technique being much more accurate than the crude swinging Barrionuevo but a couple of rights from Barrionuevo got through at the end of the round. Veron also took the fourth. He was scoring with quick accurate punches whereas some of Barrionuevo’s swings must have had them ducking in the car park. The major event of the round was a clash of heads that opened a bad cut over the right eye of Barrionuevo. The cut continued to bleed in the fifth with Barrionuevo constantly pawing at it and it was evident that the fight would have to be stopped soon. Barrionuevo was still throwing wild shots trying to land a big one before the cut got too bad and he did catch Veron with a hard left. Barrionuevo was still winging away with waywardness in the sixth when suddenly a left hook crashed on to the chin of Veron and put him down on his back. He got up as far as putting his hands and knees on the canvas but tumbled down again. Another attempt saw him get to his feet but he had no balance and he staggered along the ropes to a corner. He straightened himself up but after completing the eight count the referee wrapped his arms around Veron and the fight was over. Barrionuevo retains the Argentinian title. This is his third defence, and he has 23 wins by KO/TKO. He is rated WBC 11/IBF 15(13). He is dangerous but with his crude style he is unlikely to go beyond domestic level. Veron had reversed his only previous loss and won his last seven fights but he was nailed with a hammer here. It was said before the fight that a return had already been agreed but hopefully it will be a better fight than this one was.Ledesma vs. AquinoLedesma gets big win as he halts favoured Aquino. Although Ledesma edged the first round Aquino, much the taller boxer, was able to box on the outside keeping Ledesma on the back foot and took the second and third. Ledesma was much the quicker with better hand speed and edged the fourth and fifth. Aquino again used his height and reach to outscore Ledesma over the sixth and seventh although at the end of the seventh Ledesma got through with some big punches.. Ledesma looked to be tiring in the eighth but as they traded punches Ledesma landed a series of shots to the head. Aquino was staggering badly and the referee gave him a standing count. Aquino tried to fight his way out of trouble but soaked up some more punches leading to another standing count and after another left to the head had him on wobbly legs the referee stopped the fight. The 23-year-old “El Pitbull” gets his fifth win by KO/TKO and wins the interim WBO Latino belt. Aquino, the Argentinian No 5 was 7-1 in his last eight fights. Dublin, Ireland: Welter: Noel Murphy (12-0) W PTS 8 Gyorgy Mizsei Jr.(25-21-1). Super Chris Blaney (9-0) W PTS 8 Matiouze Royer (17-31-6 ).Murphy vs., MizseiMurphy gets a win but little satisfaction against Hungarian Mizsei. Murphy came to fight but Mizsei was there to last the distance. His spoiling tactics made it difficult for Murphy to get any rhythm into his work. Mizsei lost a point for holding in the third and flirted with disqualification with his negative tactics as Murphy settled for the unanimous decision. The 23-year-old Cork fighter who had over 100 amateur fights is based in the Bronx and promoted by Lou DiBella. Mizsei, 23, has been in with a host of top fighters and has well developed but frustrating survival skills.Blaney vs. RoyerIrishman Blaney continues to progress and looks impressive in win over Frenchman Royer. It was Blaney’s first fight over eight rounds as he is being brought along quickly but sensibly by Ricky Hatton and the “Ginja Ninja” looks a very good prospect. Tokyo, Japan: Super Feather: Masaru Sueyoshi (16-1) W PTS 10 Ribo Takahata (13-7-1). Sueyoshi wins vacant Japanese title with unanimous decision over oldie Takahata. The first round saw the tall Takahata (5’10 ½” 180cm) using his reach to force Sueyoshi back with a series of jabs. In the second Sueyoshi was using good movement and hand speed to do the scoring. Takahata continued to land some shots to the body but most of his punches were blocked or ducked by some clever defensive work from Sueyoshi. After five rounds the scores were 49-46 and 48-47 for Sueyoshi and 48-48. Sueyoshi continued to outbox Takahata sticking to his tactics and taking no chances and despite a big effort from Takahata over the last two rounds Sueyoshi was a comfortable winner. Scores 98-92 twice and 97-93.The 26-year-old winner from Tokyo extends his current winning streak to 13 fights. He is No 11 with the WBO. The 38-year-old Takahata was having his second ten round fight and his first shot at winning the Japanese title. Hermosillo, Mexico: Fly: Luis Castro (14-2-2) W TKO 5 Raul Esquer (13-3-1). Light: Julio Barraza (17-1-1) W KO 5 Edgar Ramirez (17-14).Castro vs. EsquerCastro wins the vacant WBC Fecombox title with stoppage of Esquer. In the first two rounds the aggression of Esquer saw him take both but Castro began to land some heavy shots in the third and some wicked body punches saw Esquer go down in the fourth. Castro ended it in the fifth. A double left hook to body then head put Esquer down. He made it his feet at nine but was finished and the referee stopped the fight. Home town fighter Castro, 22, has now won 7 of his last 8 fights and has 10 wins by KO/TKO. Esquer was unbeaten in his first13 fights but is now 1-3 in his last 4.Barraza vs. RamirezBeranza makes it a good night for local fighters as he knocks out Ramirez in the fifth. Barraza was unbeaten in his first 15 fights before being halted by Samuel Gonzalez in November. This his second inside the distance win since then and his eleventh by KO/TKO although local sources gave his record as 18-1-1. Second loss by KO/TKO for Ramirez..
Tampico, Mexico: Super Feather: Edivaldo Ortega (25-1-1) W RTD 7Tomas Rojas (49-16-1.1ND). Welter: Jose Carlos Paz (21-6-1) W PTS 10 Jorge Paez Jr (40-9-2,1ND).Ortega vs. Rojas Ortega scores big win as Rojas retires after seven rounds. Both fighters are southpaws but used different styles here. Rojas was using his height and reach to box on the outside and Ortega was rumbling forward getting inside and scoring to the head and body. In the first Ortega was scoring well with his right hook and keeping Rojas under pressure. Rojas landed a couple of hard lefts in the second but Ortega was making the veteran fight hard. Ortega’s pressure had Rojas looking ragged in the third and being forced to trade more. Rojas was looking a tried fighter in the fourth and fifth. Ortega was in his face for the full three minutes of each round digging hard hooks to the body from both hands. Rojas was on his toes trying to counter in the sixth but had no power and Ortega was still marching forward scoring with short punches. Ortega was not loading up with his punches but was going for quantity and overwhelming the veteran who had nothing left and retired at the end of the seventh. Big win for “Indio” Ortega and he needed it. After being unbeaten in his first 25 fights and scoring wins over useful opposition in Roberto Castaneda and Juan Carlos Sanchez he lost a unanimous decision to unbeaten Eduard Ramirez in December and this was his first fight since then. It could be that the end of the road is near for the 37-year-old Rojas a former WBC super fly champion. He looked just a shadow of the fighter who lost a disputed decision to Cris Mijares in April.Paz vs. PaezArgentinian Paz outpoints a worn looking Paez. In the first round Paez was trying to walk through Paz’s punches and whilst having some success was also shipping some punishment. Paz was on top in the second and third driving Paz back firing hooks and uppercuts with Paez already looking tired. The fourth continued in the same pattern with Paz finding the lumbering Paez an easy target but Paez did a bit better in the fifth. Paz was doing all of the scoring in the sixth but lacked the power to take advantage of Paez poor conditioning. The seventh eighth and ninth were awful rounds with Paez just walking backwards with his hands at hip level throwing about one punch a minute and Paz just trundling after him not even managing to cut Paez off. The last was farcical with Paz knowing he had the fight won dancing around the perimeter of the ring with Paez actually showing a little life but not having the energy to catch Paz. Scores 97-93 twice and 98-92 all for Paz. The 26-year-old Argentinian No 3 lost his two 2016 fights to Hector Saldivia and Guido Pitto but had scored a useful win over Gumersindo Carrasco in August. It always seemed likely that Paez would not even be a shadow of his world champion father and now it is certain. All you need to know about his conditioning is that when he turned pro he weighed 125 lbs for this fight he was 155lbs and it showed. Merida, Mexico: Super Middle: Zac Dunn (24-1) W KO 4 Luis Paz (12-4-1). Light Heavy: Manuel Ceballos (14-1) W PTS 10 Juan Carlos Raygosa (13-12-2). Middle: Elias Espadas (16-3) W KO 2 Jose Zuniga (14-3-1). Heavy: Tyrone Spong (10-0) W TKO 1 Sergio Ramirez (15-5),Dunn vs. PazWith some rebuilding to do Australian Dunn somehow turned up in Merida for his first fight since losing his Commonwealth title to Dave Brophy in March. The fight was fairly even over the first two rounds but Dunn then took control. He floored Paz twice on the way to a knockout win early in round four. Now 18 wins by KO/TKO for the 26-year-old from Melbourne who will surely fight his way back into the world ratings next year. Argentinian Paz suffers his fourth loss by KO/TKO.Ceballos vs. RaygosaCeballos retains the WBO Latino title with unanimous decision over Raygosa. Despite being a late replacement Raygosa came to fight and attacked constantly. Ceballos was hard pressed but used a persistent and accurate jab and long straight rights to stay in control. Raygosa had some success with rights to the head but Ceballos was never really troubled and boxed his way to the unanimous verdict. Scores 100-90, 98-92 and 97-93 all for Ceballos. Now 10 wins on the bounce for Ceballos. Raygosa is 2-4 in his last six fights but usually goes the full term.Espadas vs. ZunigaThe local “Latin Kid” Espadas wins the vacant WBO Latino title with a knockout late in the second round of Mexican super welter champion Zuniga. The 26-year-old from Merida makes it 7 wins in a row six by KO/TKO. First loss inside the distance for Zuniga who was 7-0-1 going into this one.Spong vs. RamirezSpong makes it ten wins by KO/TKO in ten fights as he floors Ramirez twice and splits open a cut over the Mexican’s right eye to finish the fight in the first round. The 32-year-old from Suriname (it is on the North East coast of South America and is the smallest country in South America) recorded his fourth first round victory on the bounce and his seventh in total. Based in Miami the former kick boxer (he had more than 80 bouts) wins the vacant WBC Latino title. He has been a traveller having fought in Germany, Russia, USA, Dominican Republic and Mexico. Ramirez won his first 11 fight but is now 4-5 in his last 9 but went the distance with the now IBO cruiser champion Kevin Lerena in April. Las Palmas Canary Islands, Spain: Fly: Moncho Miras (9-0) W Aramis Torres (7-0). The Spanish fly title remains vacant after Miras and Torres ended all square. Miras took the early rounds and looked on his way to victory when he floored Torres in the fourth. The local fighter did not cave in but fought back hard over the second half of the fight to secure a draw. Scores 96-94 for Miras, 96-95 for Torres and 95-95. The hope was that the winner would go on to challenge for the European Union title but a return fight is on the cards. Pamplona, Spain: Middle: Cesar Nunez (13-0) W PTS 10 Jose Charles (16-2-1).Pamplona fighter Nunez extends his winning total to thirteen with victory over Mexican Charles. The Mexican stared well and finished well but in the eight rounds between those first and last Nunez dominated the action. Charles took the first round surprising Nunez was his fast start but then the better skills of Nunez saw him take round after round. Knowing he needed a knockout Charles threw everything at Nunez in the tenth. A right shook Nunez and another combination saw him drop to one knee. Nunez then stayed out of trouble for the rest of the round and was a clear winner. Referee’s score 97-92. The 32-year-old Nunez is now hoping to go ion to fight for the Spanish title. First fight in Europe for Charles who had won his last 8 contests.